Aside from being a personal chef and cooking for clients in New York City, I’m also a voice-over artist. Over the years I’ve recorded voices for cartoons, occasional television and radio commercial spots, audio books, English As A Second Language learning systems, and I’ve even created voices for toys. Narrating textbooks (Kindergarten through fifth grade) is one of the regular recording jobs that bring me a great deal of joy and pride. As the daughter of teachers, education is really important to me. One of the things I love most about my textbook voiceover jobs is that I get to revisit history. I get to relearn lessons that slipped through the cracks and even learn new things that were left out of the books when I was a youngster in school. Throughout my years of recording, multiple times I’ve come across a lesson about George Washington Carver. Do you know who he is? Maybe you know him as the guy who invented peanut butter. (Along with discovering 300 other uses for peanuts!) As important as peanut butter may be in the culinary world, this man’s accomplishments topped this at every turn. He mastered agriculture, chemistry, botany, music, art, cooking, herbalism, and massage. George was the son of slaves, born in 1864, orphaned at an early age, and taken in by the Carvers who owned his mother before she was kidnapped, or in young George’s words - she was ku klucked! He was a sickly child and lived in a town and at a time that blacks were not allowed in white schools. So he walked eight miles to a school in Neosho, MO where he was welcomed. He wasn’t expected to live past 21 years of age but George put his faith in God and pushed past his circumstances. His young life was full of poverty, prejudice, violence, and injustice. Despite growing up in slavery, he dodged the shadows and sought the sunshine and became a distinguished scientist and a great force in racial understanding. Each time I record one of these textbook lessons about Mr. Carver, I proudly stop to tell the engineer running my session that this great man was born and raised right near my hometown in Southwest Missouri. I tell them that a highlight from my childhood was going to the George Washington Carver National monument in Diamond, MO on school field trips. I was just home in Missouri taking care of my almost 82-year-old dad and we went on a field trip! My dad is someone who is faced with opportunities to push past his circumstances on a daily basis. Our trip together reminded us that tapping into our inner spirit is our greatest resource when things look bleak on the outside. That’s where we store our faith, our will, and our dreams to keep going. Whatever our unfortunate circumstances appear to be - whether it’s failing health, financial stress, unfair treatment in the workplace, unrequited love or a flat out broken heart - I believe there’s something better on the other side. Inspired by the efforts of a young black man born in a time of slavery in Diamond, Missouri, we must keep pushing. 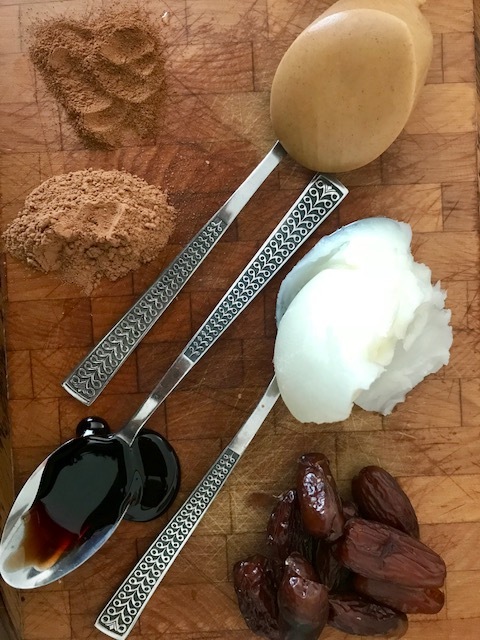 You knew there would be a peanut butter recipe at the end of this post, right? It’s easy. And a decadent sweet bite. Oh! And they're gluten free as well as vegan if those are dietary needs or preferences. With a butter knife, fill each date with a small amount of peanut butter. Place on baking sheet and place in freezer for 15 minutes to firm. While the dates are in the freezer, add coconut oil to a small saucepan over low heat and allow to melt. Whisk in cocoa powder, maple syrup, brown sugar, and cinnamon. Continue to whisk for 1-2 minutes until chocolate evenly incorporates and starts to thicken. Remove chocolate from heat and place in a small bowl. Allow chocolate to cool before removing dates from the freezer and starting to dip. 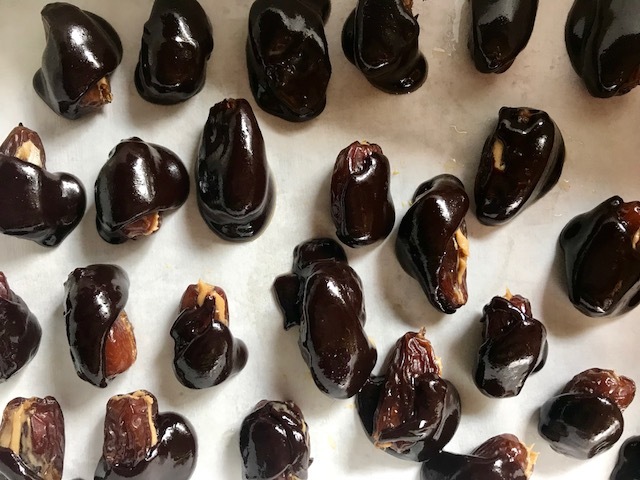 Using a fork or toothpick, pierce dates and dip each date until covered. Transfer to baking sheet. Continue until each date is covered. Place baking sheet in the refrigerator until chocolate has firmed.